Sometime just after Labor Day it began to seem that 2010 suddenly accelerated and was careening headlong toward Halloween…Thanksgiving…Christmas. Each holiday quickly came and went and, what seems like moments later, 2011 is here. In my life, 2010 was a year highlighted by reconnecting with old friends and making new ones…so today I celebrate the old year along with the new. Traditionally, of course, champagne is the drink du jour at New Year’s, and so champagne it shall be now. 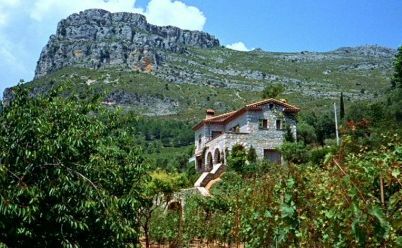 A bottle of ‘96 Dom Pérignon Rosé would be great, but I’m in the mood for something really special…an old favorite… Hitchcock’s distinctive ’55 vintage from the Cote d'Azur. To Catch a Thief (1955), or “Hitchcock champagne,” boasts a rare combination of elegance and flair. Light-bodied with a smooth finish that lingers, it remains unmatched, though it has been imitated far and wide for decades. Quickly enough the action takes off with a colorful cruise through the Cote d'Azur as the French police speed to the village of Sainte-Jeannet and the hillside villa of retired jewel thief and prime suspect, John Robie (Cary Grant). The film has just begun and cinematographer Robert Burks has already heralded Hitchcock's first film in VistaVision/Technicolor. Alfred Hitchcock and Robert Burks had initially worked together five years earlier, following the director's return to the U.S. after making two films in England. Hitchcock was beginning production on Strangers on a Train for Warner Bros. and the studio cinematographer assigned to the project was 40-year-old Robert Burks. This would be the beginning of a fabled partnership. Burks began his career in the Warner Bros. special effects lab at 19 when Hal Wallis, who liked shadows and high contrast from his cinematographers, was in charge of production. Burks, who apprenticed under James Wong Howe, worked his way up, becoming a DP and then a cinematographer by 1948. The early influence of German expressionism on Hitchcock corresponded nicely with the influences Burks absorbed at Warner Bros. and the two collaborated on twelve films from 1951 – 1964, every picture Hitchcock made during that period except Psycho. 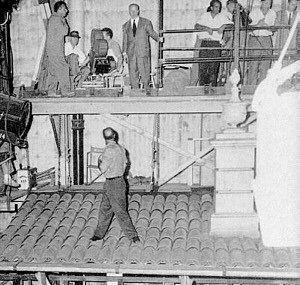 Like Burks, Hitchcock had detailed knowledge of special effects and tended to devise scenes featuring complex imagery. One of the most memorable scenes in all of Hitchcock came in Strangers on a Train, the scene in which Robert Walker’s strangulation of Laura Elliott is reflected in the lens of a pair of fallen glasses. 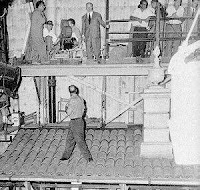 Paramount had been the only major studio to balk at the widescreen CinemaScope system when it came into use in 1953, and set out to develop a process of its own. The studio worked with Eastman Kodak and came up with VistaVision, a method that delivered a higher resolution, widescreen version of 35 mm. The VistaVision process printed down large format negatives to standard 35 mm, creating a finer-grained print and improved image. The use of Technicolor's dye transfer process was key to VistaVision image quality. For his first VistaVision/Technicolor excursion, Hitchcock contrived a stylish romantic thriller fueled by dazzling starpower. 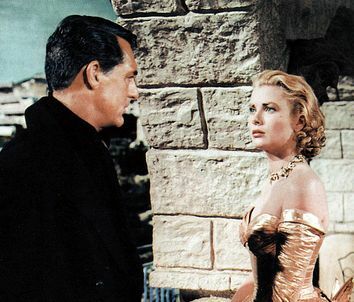 To Catch a Thief was the third and final film Grace Kelly made with Hitchcock, who would have worked with her for the rest of his career had she not left movies at the height of her stardom to marry Prince Rainier. Hitchcock’s breathtaking onscreen vision of Kelly brings to mind Josef von Sternberg’s cinematic exaltation of Marlene Dietrich 20 years earlier. Kelly was a beautiful woman but among the handful of films she made, her image as a screen goddess achieved perfection only in her films with Hitchcock. 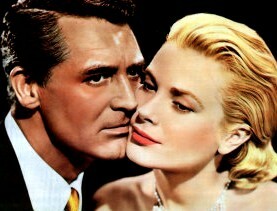 In To Catch a Thief she plays a spoiled rich girl, the ultimate "snow covered volcano" and "Hitchcock blonde." The pairing of Grant and Kelly is irresistible. The two are perfect for the roles of debonair thief/innocent man and haughty/hot debutante, and they literally generate fireworks together. 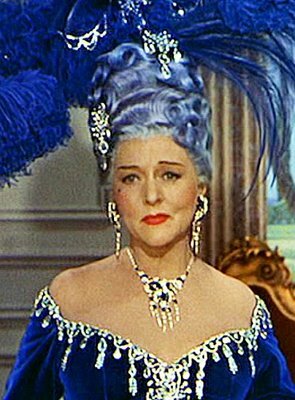 In her first Hitchcock outing, Jessie Royce Landis portrayed Kelly’s jovial, down-to-earth, bourbon-sipping mother. 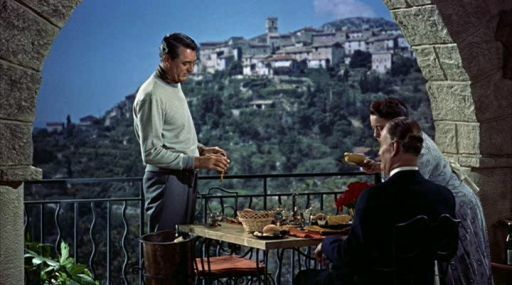 Hitchcock liked to include colorful women as supporting characters in his films, ranging from the silly (Florence Bates in Rebecca, Patricia Collinge in Shadow of a Doubt) to the clever and wisecracking (Thelma Ritter in Rear Window, Barbara bel Geddes in Vertigo). Royce Landis portrayed two of the most appealing of the latter type in this film and North by Northwest. ﻿﻿Some have dismissed To Catch a Thief for its lack of weight, however, it is a strong reflection of Hitchcock’s meticulous craftsmanship, lightly touches on some of the director’s pet themes, and is a solid film of its genre. Hitchcock delivered exactly what he intended, an exciting, lighthearted, romantic thriller. All elements click into place…from the John Michael Hayes screenplay to Robert Burks's VistaVision/ Technicolor photography, Lyn Murray’s score, Edith Head’s eyeball-popping costumes, two scintillating stars and the Cote d’Azur setting. To Catch a Thief was successful and influential, and many later films bear its earmarks... most prominently Stanley Donen’s Charade, as well as his Arabesque, William Wyler's How to Steal a Million, Blake Edwards's The Pink Panther and countless romantic romps ever since. great supportive argument for a so-so movie..I agree 100% with the plusses...CARY GRANT...PHOTOGRAPHY...CRAFTMANSHIP..this will definitely move up my "hitch list"...just don't expect me to relike the remake of THE MAN WHO KNEW TOO MUCH!!! If Burks apprenticed under the great James Wong Howe, it's no wonder he was so good. I like To Catch A Thief, but I have to admit it is not one of my favorite Hitchcock. However, it is a beautiful and sophisticated movie with a great cast. Actually, there is only one Hitchcock movie that I really never liked, The Trouble With Harry. Just not my style, I guess. Wonderful article, Eve, well-written and well-researched, as always! Such a coincidence that we both blogged about 'To Catch a Thief' almost at the same time! I chose it almost as an excuse to write about VistaVision and the advent of wide-screen to movies but your post is full of really interesting information. Eve, Awesome review!! I loved the snappy dialog in this film, with all the sexual innuendos. For me... it was interesting that Grant (with his accent) could really never be mistaken for an American, even though he usually played one. I think fans of Hitchcock, Kelly or Grant will want to check out this film. Like Becky, not much of a fan of the film, The Trouble With Harry. Eve, TO CATCH A THIEF ranks among my favorite Hitchcock films. If one looks deep enough, some of the familiar Hitch themes are there (e.g., the wrongly accused man). But, for the most part, it comes across as Hitchcock in the mood to have some fun--and that joy comes across on the screen. Really, my only beef (and it's a very minor one) is that the lack of suspects makes the real culprit obvious from the outset. Still, that didn't negate the sheer sense of fun, including the amusing double entendres during the Cary-Grace picnic scene. A wonderful detailed review. I totally agree with your take on Grace Kelly. A beautiful woman who never looked better than in the three films she made for Hitchcock. I recently took another look at DIAL M FOR MURDER and Hitch films her with such reverence, and Grant is arguably the perfect Hitchcock actor, charming, debonair and dark. It is a gorgeous looking film in both its look and its stars. Glad you liked the post John...I think in their final outing together, Hitchcock presented Grace Kelly more beautifully than she had ever been filmed, absolutely ravishing.